Cruising is just for old people, right? I've never been on a cruise ship before and imagined them as floating palaces full of old-age pensioners, playing bingo and dressing for dinner at the captain's table in their faded finery as they cruise around colonial-era Caribbean islands. I had the opportunity to test and maybe challenge my assumption last week after being invited to spend the day on the MSC Preziosa, while it was in port in Southampton. An event for bloggers called Blog Camp on Board, run by Flea Enterprises, the company behind the Tots100 and Foodies100 indices and blogger communities. I was expecting a fairly big ship but was amazed at my first glimpse of the MSC Preziosa - it was the size of several blocks of flats. There's a reception and drop-off area next to the ship, then boarding took a little while for security reasons, but as they called names alphabetically, I was in the first group to board and led the way up the steps onto the ship. My first impression was of glitz and glamour - plush carpets, shining surfaces, wide corridors and big open spaces. In fact it was very easy to forget I was on board a ship as it reminded me more of a luxury hotel. We were initially shown into the theatre, which can seat over 1,600 guests - though today there were only about 140 bloggers in the audience. 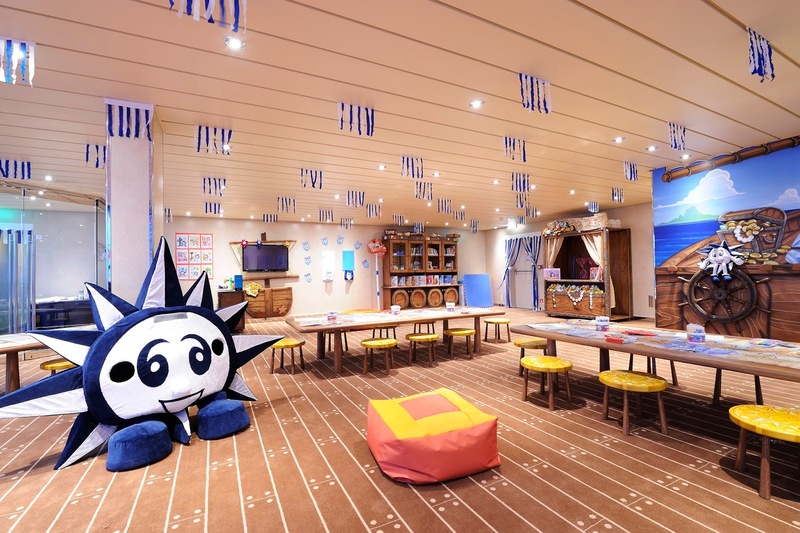 We were given an overview of the kids' club offering by the Youth Activies Manager Mateo, with a little help from two of the ship's mascots. 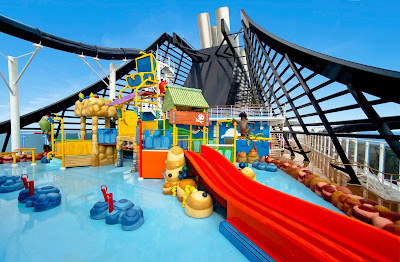 As I'm not a parent blogger - or a parent yet - I wasn't that interested in the children's facilities but it was impressive hearing that they have five different kids' clubs they have, divided by age, and some of the activities the children can get up to across the MSC cruise fleet - from cooking to mixing DJ sets and filming a web series called Kelly & Kloe - of which we saw a quick snippet. Children can also participate in activities where at the end of the cruise they take home a certificate stating they are junior ambassadors for Unicef. Entertainment for the adults sounded fab - I know that cruises offer different shows and often have resident singers or cabaret acts, but did you know that MSC is the first cruise line to announce a partnership with Cirque du Soleil? The day was divided into different sessions for smaller groups of bloggers and my first stop was the spa where we watched a make-up demonstration. It would have been better if they had done more of a tutorial but the idea was to show one of the things that passengers can have done on board (though you pay extra). We only saw part of the spa but the whirlpools certainly looked nice. The MSC Preziosa is huge, with 18 decks, 14 of which are accessible to passengers, carrying 4,345 passengers when at full capacity - which it was that day, so we weren't able to see inside any of the cabins. It also has 1,388 crew which makes for an awful lot of people on board, though today most of them seemed to have disembarked and gone into Southampton - shopping at Primark judging by most of the carrier bags I saw people carrying when they were coming back! So it was unsurprising that we couldn't take in the whole ship as part of our tour, but I got to see the outdoor pools on the top deck, the Doremi kids club, a crèche (or kids club for very young children), a casino, gym, the Safari lounge and one of the bars, and the focal point - a staircase where every step is inlaid with Swarovski crystals. It must be the most photographed point on the ship - the bloggers I was with all took time to stop and take pictures and I can just imagine guests using it as a backdrop when they are glammed up for the evening! We didn't get to see the children's Doremi castle, the 4D cinema, library, bowling alley or the art gallery or any of the shopping boutiques (there's even a duty free mini mall on board) so I indulged in checking out some photos and an online 360 degree tour afterwards. roast pork with some other bits and pieces! We were treated to lunch in the main restaurant (there are about eight restaurants on board I think) with a choice between a menu and a buffet. I went for the buffet as I think you can tell a lot about the quality of food when you are serving yourself from a buffet. The options today were roast pork (carved straight off the bone by a crew member), sweet and sour pork or fish, with roast potatoes and Brussels sprouts (a shame the only vegetables on offer were ones I hate!). There was also a selection of salads, breads, hams and cheeses and of course an awful lot of desserts to choose from! The food was good - I chose the roast pork, and a trio of desserts (they were fairly small - though not that small!). Unfortunately I couldn't enjoy the wine on offer as I'm pregnant but a helpful waiter kept bringing me soft drinks, which I needed as I'd gotten a bit dehydrated from not drinking much during the morning and watching the make-up demo in the warm spa! After lunch there were some events aimed at bloggers - I went to a session on food photography presented by Sandhya from Sandhya's Kitchen - and Sally, founder of Flea Enterprises, did a session on blogger metrics. The day ended with a glass of bubbly or a non-alcoholic cocktail and a Q&A with MSC's UK Managing Director Antonio Paradiso, where he covered everything from the background of MSC to carbon emissions of its ships. 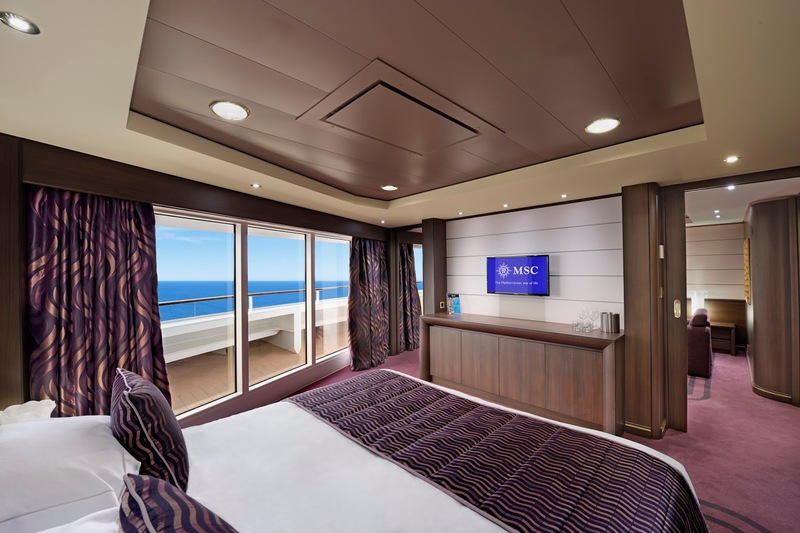 MSC Cruises is known as more of a European cruise company and has had a relatively small presence in the UK, but next year the MSC Magnifica will have Southampton as its home port. There are already plenty of departures from Southampton on both the Preziosa and the Magnifica but this should make it more appealing to UK passengers. They are even making the effort to target their cruises more at a British audience, down to details like putting a kettle in the cabins and partnering with Yorkshire Tea as their chosen brand of tea! 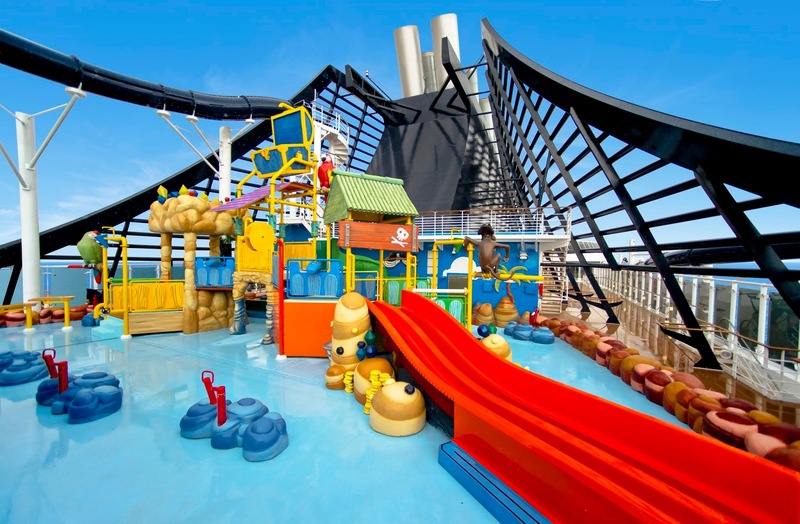 MSC has 13 ships at the moment and is getting ten more in the next nine years; they are particularly focused on families and children and interestingly, Antonio told us that cruise demographics are changing, but even across the industry the average age of a cruise passenger is 55 - on MSC Cruises it's 43. Having spent the day on board and seen the sparkly modern facilities, the range of services for both adults and children - and by adults, I mean people like me, not just my grandparents' age - I'm impressed. I still don't know whether I'd actually book a holiday but there's no denying it's an efficient way to visit several cities and countries on one trip - but the day definitely dispelled some myths and misconceptions. And there wasn't a bingo hall in sight. Ha! I'm so glad I'm not the only one who half expected to see a bingo hall! Thanks so much for coming along and for such a lovely write-up of the day.